Financial aid is available from a number of sources to assist you in financing your midwifery education. The following information is by no means exhaustive, but provides initial leads and resources for financial aid. Contact the financial aid officer at the schools you are considering attending. They are professionals at finding scholarships, loans and other forms of assistance and can be a very valuable resource. Congress appropriates millions of dollars for a variety of programs supporting students, including loans/ scholarships for eligible applicants and service paybacks for those who work in underserved/rural areas. Extensive information on federal funds can be found at the Health Resources and Services Administration (HRSA) Web site. The A.C.N.M. 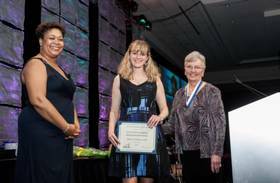 Foundation provides up to six scholarships every year of $2000-$4000 each to midwifery students who are ACNM members. Guidelines and applications, as well as a list of recent award winners, are available at www.midwife.org/Foundation-Scholarships-and-Awards. Questions can be directed to the Foundation Office at (240) 485-1850 or [email protected]. Student nurse-midwives/student midwives are eligible to join ACNM. To become a member, click here. The Indian Health Service (IHS) is committed to encouraging American Indians and Alaska Natives to enter the health professions and assuring the availability of Indian health professionals to serve Indians. The IHS recruits students for the following programs: The Indian Health Professions Preparatory Scholarships; the Indian Health Professions Pregraduate Scholarships; and the Indian Health Professions Scholarships. More information is available at https://www.ihs.gov/careeropps/loanrepayment/. The National Health Service Corps (NHSC) offers a loan repayment program to nurse-midwives and other health care professionals that commit to working in underserved areas across the country. The Scholarship Program offers payment of tuition and fees, books, supplies, and equipment for up to four years of education, and a monthly stipend. In return, for each year of support, the recipient must serve one year in a federally designated health professional shortage area of greatest need. For Scholarship information or a Loan Repayment application, call the NHSC Helpline at 1-800-221-9393 or e-mail [email protected]. To find out more about this program, visit http://nhsc.hrsa.gov. The State Loan Repayment Program (SLRP) is part of the overall strategy of the Health Resources and Services Administration (HRSA) to improve access to underserved communities. NHSC grants matching funds directly to states to operate their own loan repayment programs. SLRP does not provide loan repayment directly to individual health professionals, and not all states offer SLRP. Click here for the list of states that are funded. Primary care health professionals who are providing full-time clinical services in a public or nonprofit facility located in a federally designated Health Professional Shortage Area are eligible for this program. Eligibility requirements and benefits vary from state to state. For specific information about eligibility and requirements for your state's educational loan repayment program, contact your individual state loan repayment program point of contact. Scholarships and loans are available from many different organizations and agencies. Check with your state higher education and public health departments for state funds. Contact organizations such as the American Association of University Women for information on educational funding opportunities. The Johnson & Johnson Foundation provides information about nursing education scholarships at http://www.discovernursing.com/scholarships#no-filters. The March of Dimes also offers scholarship opportunities. Another online resource which you may find helpful is MoneyGeek.com: Paying for College. For more general information about how the federal government provides funding to educate health care professionals, please see the report Health Care Workforce: Federally Funded Training Programs in Fiscal Year 2012 by the US General Accountability Office (GAO), published August 2013. Create your own source of funding. If you can demonstrate the need for nurse-midwifery services in your community, a local hospital, clinic or private practice may be willing to support you in full or part in return for a practice commitment.